This DVD set, part-documentary and part-concert, is fascinating and must be placed in a rather select category, a sort of hybrid of concert performance and education. This kind of thing has been done before, most notably by Leonard Bernstein in his Young People's Concerts and Norton Lectures. I cite those two examples particularly because conductor André Previn's approach here seems a sort of cross between them – not quite as probing and in-depth as the Norton Lectures, but not nearly as rudimentary as the Young People's Concerts. The three Kultur Video DVDs here document an apparently highly successful series of six programs, produced by the BBC and presented on BBC television in 1984. 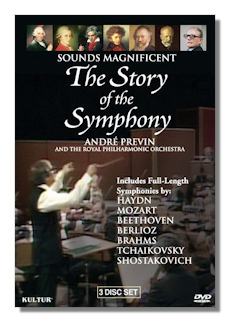 The format here is rather simple: Previn presents historical and biographical information surrounding a particular symphony, with excerpts from the work to illustrate certain points, and then leads a complete performance of it. All performances are presented live, apparently in a BBC studio, and are generally quite good, despite some instances of imprecision. The sound is a bit dry but more than acceptable for the early-1980s, though of course not up to current standards. The camera work is fine but the picture quality, certainly good enough for its day, lacks the high-definition quality of modern productions. But what sets this effort apart from most other similar issues is the commentary by André Previn. It is enlightening, priceless really. He offers insights into the music in great detail – ear- and mind-opening detail in fact – and explains the frame of mind of the various composers involved. He delves into their lives, into their triumphs and sufferings, their loves and neuroses. In short, he draws you into the world of the music presented here. That said, composer Herbert Chappell must be given some, maybe a great part, of the credit here, as he was the writer and director of the project. The Haydn Symphony #87 is given a solid reading, well performed by the Royal Philharmonic. The Mozart 39th is also quite compelling, though I think the Andante con moto second movement could have been a little more spirited, a little more "con moto". Perhaps more "con moto" for the Beethoven 7th would have been desirable, especially in the first movement. But Previn chooses to focus on the epic side of this "apotheosis of the dance", and brings out much detail in the process. Rhythms have plenty of bounce and spirit in the last two movements. Previn and the RPO also deliver a solid reading of the first movement of the Beethoven 5th. The Berlioz Symphonie Fantastique is spirited and obsessive (as it should be) in its focus on the composer's love Harriet Smithson, the inspiration for the work. The opening and closing panels storm the heights, while the inner three movements are given splendid readings, especially the March to the Scaffold. The Brahms 4th Symphony comes next. Previn quotes many detractors of the composer, including George Bernard Shaw, who could be quite scathing in his judgments. But I'm glad that Previn presents all sides and much else as well. The performance of the Brahms 4th is effective in capturing that complex mixture of serenity, passion, joyful vigor and glorious triumph. Another detractor of Brahms, as Previn notes, was Tchaikovsky, whose tortured life he documents to lay the groundwork for the great 6th Symphony. Previn also delves into the speculation about Tchaikovsky's death, seeming to endorse the idea that he committed suicide on orders from his jurisprudence classmates over issues of his homosexuality. The performance of the 6th Symphony is warm and lush, not high on passion. That said, there are plenty of moments – the first movement development section, for one – where the music turns fiery and impassioned. The livelier middle movements come across with spirit and commitment, and overall the performance of the symphony is quite convincing. Previn recorded the Shostakovich 5th twice prior to this effort; the earlier, from 1965 on RCA, is rightly considered among the very best versions. This Shostakovich 5th is also a fine performance, with many of the same qualities of the 1965 effort: the second movement here has plenty of bite and the finale's triumph comes across with a sense of ambivalence, as it should. The third movement of the Vaughan Williams 5th Symphony is also presented, and is among the finest performances here; making you wish the whole work had been presented. The concluding section of the Roy Harris 3rd Symphony is also performed, quite convincingly too. One thing you can say about most of the performances on the three discs is that they are pretty straightforward accounts, free of eccentricity and reasonably well performed. There are 525 minutes spread over the three discs, which includes Previn's lectures, musical examples and the performances themselves. This can be an excellent learning tool, especially for music appreciation courses, but can also be enjoyed simply for the generally fine performances and the many insights in Previn's commentary.